Can you imagine what raising a handful of superhero kids would be like? We imagine you'd have to have elastic arms and super strength to keep your sanity and your children intact we have to believe it would be pretty fun as well. When it came to calls from the principal you'd never know what kind of situation you were going to run into. And while it might not seem fair, it would be pretty fun to see what your child could do when it came to sports. There would be plenty of trouble and plenty of mess. But, just like your normal life, family life would certainly stay interesting. If you're looking to see what it would be like to have a little master of speed in your house, let your little one throw on Dash's uniform and see how fast he can go! This jumpsuit looks like it's straight from The Incredibles. Your child will feel like he's ready to run in this red and black jumpsuit. The suit is one piece with black gauntlets and boot covers attached. The chest has muscle padding that will make your kiddo feel super. 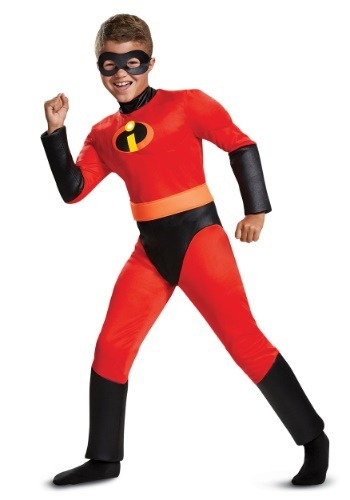 Emblazoned with the Incredibles logo on the chest, everyone will know what family you kiddo stands for. We mentioned Dash's naughty nature in the first paragraph but Dash has a major interest in doing good as well! Dash has a big heart. He's there for his family, especially for that baby brother of his who proves to be such a handful. And he's there for the little old lady on the street. His talents aren't only his own, those fast little pistons belong to the community that needs him. Now, if only those officials would de-criminalize being a super!